Right of First Sale for eBooks? Since 2011, Amazon has been filing patents in the United States and Canada around setting up a marketplace for used ebooks. In January 16, they filed a 46-page document with the Canadian Intellectual Property Office which outlines their plans in more detail. In the United States the first-sale doctrine (also known as the right of first sale) limits the rights of the copyright and trademark owners, and protects the distribution chain, library lending, video rentals and secondary markets for copyrighted works (like used bookstores or used record stores) - by providing rights to the purchaser (and owner) of a physical copy of a work to distribute that physical copy as they see fit. However, the first-sale doctrine does not hold for digital objects because there is no transfer of a physical copy from the copyright owner to the purchaser. Thus, the resale of ebooks does not have legal protections in the United States. So, Amazon's attempts at making a used ebook marketplace seems ambitious. A used ebook marketplace would require new interpretations of the doctrine of first sale, to allow ebook purchasers to become owners and resell their copies. Amazon seems to be willing to provide the copyright owner a percentage of the sale, which may earn them support (or at least less ire) from publishing companies. Also, Amazon hopes to make ebooks more like print books by removing ebooks from the seller's inventory once the book has been sold, even though ebooks are copies of an original publisher-owned digital file. One could in theory continuously copy and disseminate an ebook over and again, retaining their file. Amazon's forceful removal of the copy from the seller's inventory might persuade copyright holders that some other individual or entity is not repeatedly profiting from the reproduction and sale of the ebook. However Amazon manages (or doesn't) to set up its marketplace with the acquiescence of publisher and the support of the law, it will be interesting to watch how Amazon and its used ebook marketplace will challenge information policies. And I'm hopeful that I can clear out my Kindle library, and get a few cents for new books. 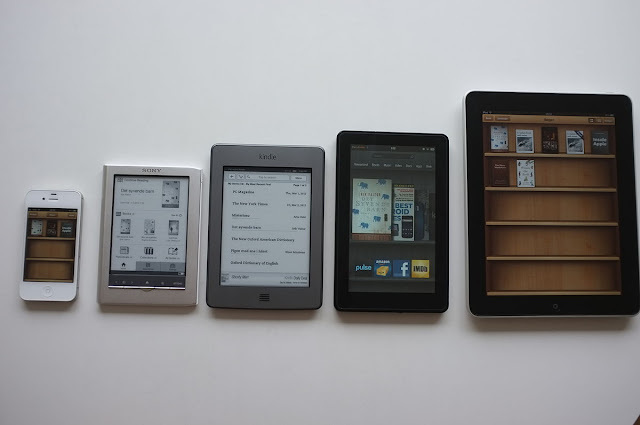 ​"eBooks can now be read on a large variety of devices" by Per Palmkvist Knudsen, CC BY-SA 3.0.
Business School Libraries - Where Next?